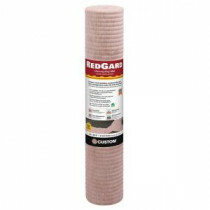 Buy online RedGard 54 sq. ft. 39.4 in. x 16.5 ft. Uncoupling Mat Membrane for Tile and Stone RGM254 and leave review or share with Your friends. RedGard Uncoupling Mat is a waterproof, vapor-proof uncoupling membrane that can be used for crack-suppression in most tile, porcelain or natural stone installations and can be applied over challenging substrates such as installation over green (young) concrete and single ply 19.2 in. (49 cm) oc wood framed floors. RedGard Mat is designed differently than bonded membranes, with a sacrificial layer of fleece reinforced fabric that shears away or uncouples, when exposed to excessive substrate movement, absorbing stress and preserving the surface and integrity of the tile. The mat’s bonding layers have reinforced fleece which locks mortar into the mat, ensuring strong, reliable installations.